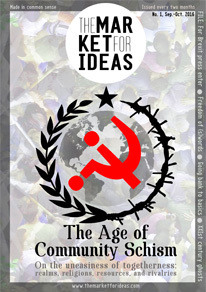 The Market for Ideas is an essay journal “made in common sense”, hosting a community of individuals and a communion of individualities. It is a modest tribute to the ideal of a society of high standards which fosters reasoned debate and principled argumentation. Its origins and roots are Romanian, but its outlook is International, striving to make sense of a complicated world and to extract valuable lessons for elites and those who aspire to such a status. It is ultimately a platform for dialogue between “prosumers”, the consumers and producers of ideas. Its meaning is to be a stage and possibly a proving ground for a host of issues presented for consideration, from exhibits of scientific rationality to artistic sensibility and everything in between. The Market for Ideas is published under the auspices of the Romanian-American Foundation for the Promotion of Education and Culture (RAFPEC), whose preoccupations center on the cultivation of our civilization’s values in keeping with historic roots and the transatlantic dimension. The Romanian cultural space is one of sustained cultural synthesis, whose animating spirit is conducive to both passionate argumentation and an openness to criticism and whose moral fiber evinces an ideal of freedom of conscience. The publication is addressed to both Romanian and foreign contributors, hopefully in symmetry and synchronicity, to build a dialogue favourable to the ideals of improving quality of life and the amelioration of the private and public governance of Romania. Scholars and artists, entrepreneurs and managers, as well as public servants will exchange ideas with foreign counterparts, through the medium for International networking specific to these social and professional segments. The ambient space the publication provides for the cross-fertilization of ideas has three notable dimensions. The first is the academic dimension, bringing together Romanian and foreign Universities, independent research institutes and nongovernmental organizations preoccupied with culture and education. The second is the business dimension pertaining to National and multinational companies and other types of organizations representative of business concerns, which are facilitating and investing in research, development and innovation. Last, but not least, we have the segment of public authorities, made up of public institutions, both in Romania and abroad, involved in the global flow of ideas and resources. Aside from the obvious state actors, we will also mention embassies, trade representations, cultural centers, among others. The Market for Ideas is an International publication devoted to the freedom of seeking and expressing scientific or popular truth, as assessed and assumed by the issuers of the published assertions, in good faith and with all due diligence. The expressed opinions belong strictly to their creators, who bear the full responsibility for their soundness and accuracy. By no means do they engage the liability of The Market for Ideas or of the institutions with which it is affiliated. The content of The Market for Ideas can be quoted respecting the customary moral and legal norms on intellectual property. The full reproduction of the enclosed articles is prohibited without the explicit consent of both the editors and authors.